The initial reason for the ban was to do with pacemakers, a concern that mobile phone signals could interfere with the pacemaker, potentially causing cardiac arrest. However the evidence for such a possibility is lacking at best. However, I have another reason for wanting to keep the embargo on mobile devices. My body often spasms, and those spasms are involuntary, my arms and legs on my left side will flail and and hit a passenger sitting next to me on a train or as I am walking down the street. You find ways to isolate and distance yourself physically. The empty seat next to you is your friend, it means that on this journey at least, you won’t do anyone any harm. Pain can also make you a mean person. It’s not simply that you avoid people, perhaps on the quite understandable assumption that you could hurt them, you begin to people as something to be avoid, and obstacle on your way from A to B, rather than a potential encounter with a fellow human being. I know, of course, that most of it is in my head, most of the time my body won’t actually spasm and flail and that I might go many a train journey without injuring anyone. However, there is that word ‘might’, the fact is that occasionally my body does seemingly act independently of my will, so I fear, however unreasonably, that it is only a matter of time before I get accused of assault through some involuntary movements of body. I am concerned about JR East’s relaxing of the rules on mobile phones.. It seems, on face of it to be a perfectly reasonable adjustment. After all many people use them anyway, regardless of the warning not to do so. Despite their being banned at hospitals, mobile phone signals don’t seem to cause any problems for pacemakers. 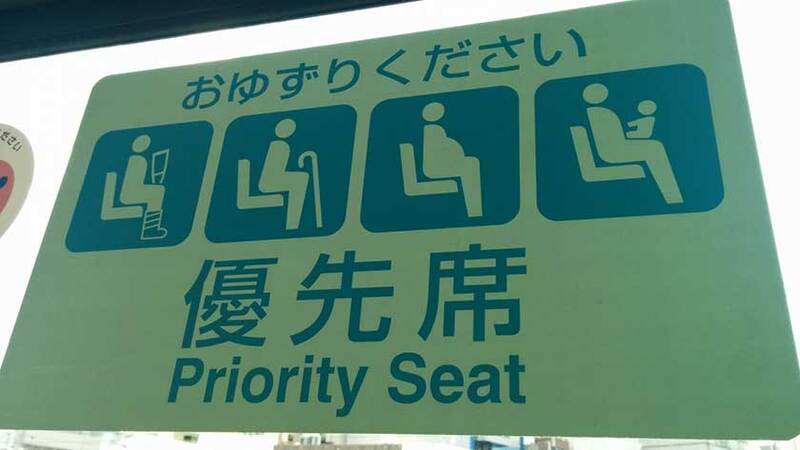 So we should all be free to call people from sitting on the priority seats, right? Believe me, I sympathize with those who want to make calls from those seats, I have, to my shame, made calls from them too. However, if you are sitting next to the left of me, and holding your phone or you lap or near your ear, there is every possibility that it will be knocked out of your hands by a spasm, and there is nothing I can do to prevent that happening. If you don’t believe me you need only examine the scratches on my own generic smartphone – which I keep discreetly hidden in a bumbag on train journeys, lest it fall foul of my own disability.